Bloody Protests Taken To Prime Minister's Gate In Thailand : The Two-Way For the second day in a row, demonstrators in Thailand have spilled their own blood in a symbolic protest against the government of Prime Minister Abhisit Vejjajiva. For the second day in a row, demonstrators in Thailand have spilled their own blood in a symbolic protest against the government of Prime Minister Abhisit Vejjajiva. 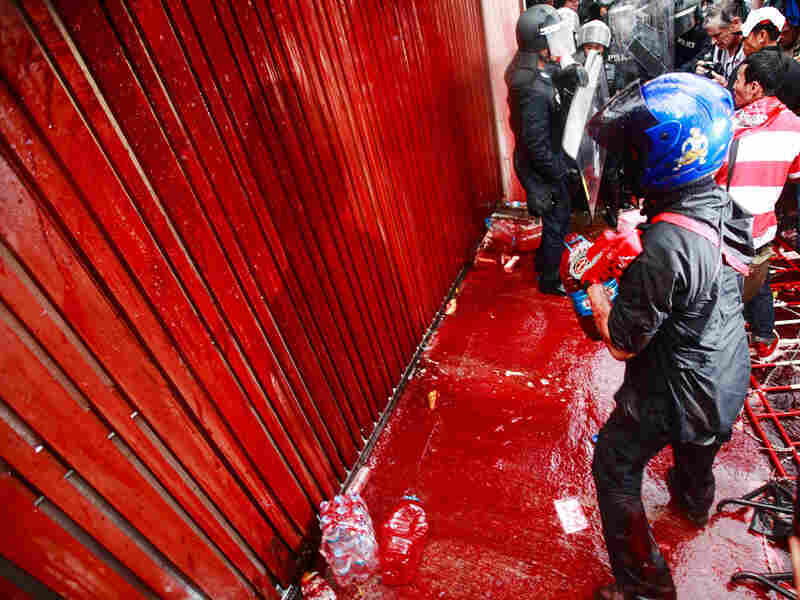 According to the Associated Press, "red-shirted protesters hurled plastic bags filled with their own blood into the residential compound of Thailand's prime minister Wednesday, hoping their shock tactics will bring down his government." The BBC says that "security forces agreed to let a few of the red-shirted demonstrators splatter the blood outside the compound . ... They went on to picket the U.S. embassy, accusing U.S. intelligence of bugging deposed ex-(prime minister) Thaksin Shinawatra." NPR's Michael Sullivan, in Bangkok, says the walls and roof of the prime minister's compound were splattered with the blood, which the protesters have donated to their cause. As he reminds us, the demonstrations have attracted crowds in excess of 100,000 people in recent days. "The demonstrators," he says, "accuse the current prime minister ... of coming to power through illegitimate means" in the 2006 military coup that overthrew Sinawatra. They want Vejjajiva to dissolve parliament and step down, and that new elections then be held. The government has rejected those demands.